A rare portrait, believed to be of Shakespeare's only known patron, has been discovered using X-ray technology. Art historians from Bristol University have found what they believe is a picture of Henry Wriothesley which was painted over in the 16th Century. To the naked eye, it is a portrait of his wife Elizabeth Vernon, dressed in black and wearing ruby ear-rings. The hidden picture was uncovered when the work was X-rayed in preparation for an exhibition in Somerset. 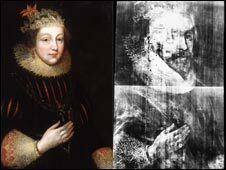 Radiography revealed that underneath the oil portrait of Elizabeth I's maid of honour was a ghostly male figure - an older work which had been painted over. From the man's flamboyant appearance and long auburn hair, experts believe it shows Vernon's husband, Henry Wriothesley, the third Earl of Southampton. He was Shakespeare's only known patron and experts said finding the picture was a significant discovery, although there are no plans to chip away the portrait of his wife to uncover him properly. It is thought the unknown artist painted over the image, possibly because a commission for a double portrait of husband and wife was abandoned in favour of the single portrait seen today. The painting is one of 12 to be seen in the display - entitled On the Nature of Women: Tudor and Jacobean Portraits of Women 1535-1620 - at Montacute House in Somerset. Among other discoveries are a portrait thought to be of Margaret Douglas, Countess of Lennox, who was Mary Queen of Scots's mother-in-law and one believed to be of Lady Jane Grey, both of which have not been seen in public for more than 70 years. It is the first display for the National Trust and the National Portrait Gallery to have been curated by university students.